Recently I was talking to sources, asking how moch the Fujifilm GFX 50R will cost. I didn’t get an answer yet (no final price for the Fujifilm GFX 50R has been set yet), but I got to hear an interesting tidbit. 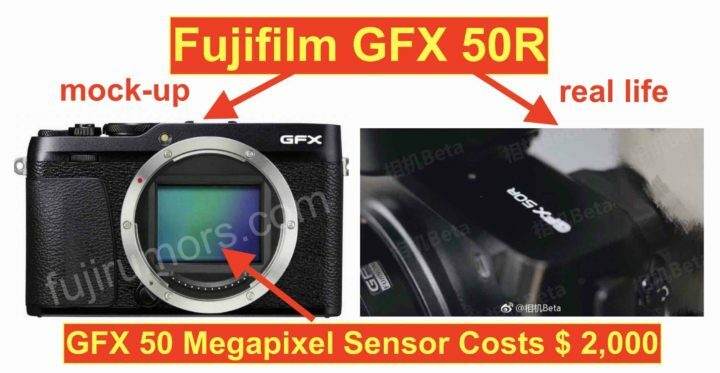 The 50 megapixel medium format sensor of the Fujifilm GFX alone costs $2,000! This comes from trusted source, hence you don’t need to take any grain of salt. With that said, it seems clear to me that it will be hard for Fujifilm to price the Fujifilm GFX 50R below $4,000, since you have to build also an entire camera around that $2,000 sensor and ship it all over the world, pay the labor cost etc. Quick notice: unlike suggested elsewere, the Fujifilm GFX 50R won’t be announced on September 23 ±1 day but on another day. Make sure to follow us on Facebook, Instagram, RSS-feed and Twitter and to join our Fujiflm GFX facebook group as well as our Fujifilm GFX page for 100% GFX news and rumors only. previous post: HOT!!! Fujifilm GFX 50R First Image Leaked?